It is an incredible quilter who has made it a project to demonstrate a new freemotion quilting design each day. The video tutorials are excellent, she describes the difficulty level for each one, and I really love the ideas. I think I may need to invest in some bulk thread in the near future! I'll have something soon enough. I think I'm going to put my wonky blogs on hold for awhile and sink my teeth into a project that will get me more motivated. Oh no!! I will now have TWO (wonky quilt and finish machine quilting my vintage bed sheets quilt) works in progress.... ACK! That's so not me! I finish what I start! I love my library. 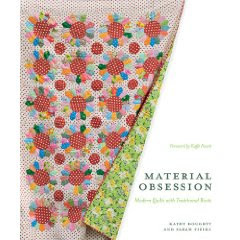 I was the first one to reserve and sign out the new Material Obsession book! This book was very informative. 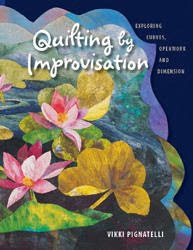 Don't let the cover fool you into thinking it's about landscape quilting. It is not. I am still reading it, but I'm learning alot about a different way of piecing and quilting. There's alot of information about colour theory, making improvisational blocks, overlays and adding dimension - and how to do it, with simple projects to practice the concept. The author's website has some wonderful ideas as well... check out the gallery! Are there any books that totally inspire you? Do you find that your quilting interests or style waxes and wanes? I started out really loving anything to match home decor. Then onto bold bright primary and gemstone colours (think Laurel Burch style). Then I discovered the modern quilting and the modern fabrics with lots of white sashing and simple, traditional blocks. I'm still very into modern, simple blocks and I love solid colours. But now my interest is leaning again towards improvisation. And yet, I'm not a large producer of quilts. I just love learning about the process, trying it out and doing/learning something new. I'm not a multiple quilt generator, wanting to become a famous blogger, or a famous pattern maker, or even a famous quilter.... I just want to learn all about the art form and let my creativity evolve through my research. mandatory cat in the way as usual shot. We went looking at an acreage today. It is the same one we admired last year, and then it sold. The people who bought it were investors, and reno'd it, and we really like the renos. Things here have been hectic on the life front - we almost endured a transfer to somewhere far, far north of us, but a paid move, and financially great. But location, not so great. So now, that has not turned out (thankfully) and we are speculating dh to take reigns of the ship here in the city in a promo way, and it may mean us staying for a few more years. If that is the case, I wanna move to an acreage! If it is not the case.....I want to move back home to BC! LOL. So has the story been of my past 4 years. Are we moving this season? yes? no? The cost of living here is so much less than in BC. We get more bang for our buck here...we just miss home is all. I'm assuming that the longer I live here, the lesser the yearning for 'home' gets. anyone live on an acreage? There's something romantic and freeing about the thought of it...and something terrifying about it too. Right now I live in a cookie cutter development, where I can hear my neighbours sneeze. Is that too much to ask for? A design wall in my forever home please? Anyone else have a husband who seems to be constantly on the verge of transferring or restructuring positions? It's so frustrating!!! Anyways, back to the original topic - colour inspiration - Amy asked about it...where we get it from, and today, I found some in an unusual spot. Crochet or Knit, which is easier? I'm going to give it a go again. I need to do something while I'm 'relaxing' watching my new fall tv shows. I just can't be a couch potato and not do something at the same time. I purchased some Kona Cotton Solids from the Fabric Shack . They were super reasonable at $3.99/yd US$. It was very fast shipping, and they included a package of machine needles in my package! Cool! This is for a new quilt that I got some inspiration for, now I need to execute it! I'm really loving the charcoals, but may add or swap out a couple of browns and a couple of the greens. It's so hard to go by the colour swatch on websites, but what a nice package to get in the mail today. I have done NO quilting or sewing this week. I'm going downstairs right now to fix that. I'm 1/2 way done machine quilting my sheets quilt, and have no clue how far I'll get with my wonky log cabins...but I need to sit down and soothe my soul for abit. This week and last have been a bit stressful life wise, but should be calming down next week. I hope. I cut all of my Christmas fabrics for the wonky log cabin quilt along on flickr. Tried a bit of wonkiness, and need to be more daring with my slicing and dicing to create a more obvious crooked block, rather than one that looks like I was sloppy. My next one will be a 1/4 wonky, which I have a feeling I'll love alot more. My backing fabric on my bedsheets quilt looks SO adorable. I cannot wait to show you the finished project. Just a few more lines to go (grid quilting) and the binding still to put on. Then, to find a recipient. Onto gardening news...look at my bountiful harvest! Okay, trick photography. They're wee tomatoes. LOL. I planted cherry tomatoes and grape tomatoes. The grape ones taste much better than the cherry ones, and are much firmer and delicious. The green ones are spilling everywhere on the plant, so I'm hoping to get much more in the next few days. Weather looks cooler again, so I'm feeling a little leery about that. My cucumber plant has lots of yellow flowers, but no cukes. :( I think they may not happen this year. and my crazy carrots - well, stay tuned. I'm going to pull some this week. They look very wonky too! I ordered some solid fabrics for my next quilt and can't wait for them to arrive. I have a feeling solids and shot cottons may be my future. I get the most inspired when I see solids in a quilt. My vintage bed linens have finally been used! I pieced it with some stash of white, as well as a piece of my Katie Jump Rope in blue. You'll see it all in a bit completed...I'm going to back it with my ladybug backing fabric I picked up long ago. Top it off with back to school for my big guy...he's a big grade 2'er now and is thrilled that he is now allowed to (according to school rules) play in "the BIG forest" now. LOL. Little guy is missing his big bro, but he'll be off to preschool class twice a week starting next week. I've been also doing lots of thinking about what fabrics to cut apart for a Wonky Log Cabin Block Quilt Along. And of course, my life wouldn't be complete without millions of more thoughts trapped in my head, such as this colourway of solids I thought up for a modern quilt I've been wanting to try out. Still need to purchase these, however..and may wait until my wonky quilt is underway. To top it off, I've been doing some home fixes - getting paint for the deck, fixing the fence, repairing the play structure roof, and the endless weeding in our garden and cobblestone paved back yard. **hint...when buying ahome, even though pavers look so beautiful, and look like not a lot of maintenance - they are. those weeds pop up daily, in abundance.